A picture from a previous Brunei-Thailand defense engagement. The recent trip spotlighted the ongoing activity between the two sides in the security realm. Last week, Brunei’s land force commander made a scheduled introductory visit to Thailand. While the trip was just the latest in a series of ongoing interactions between the two fellow Southeast Asian states, it nonetheless put the spotlight on the state of the defense aspect of their broader bilateral relationship amid changes at play within the two countries as well as in the wider region. As I have observed previously in these pages, Thailand and Brunei share a bilateral relationship that extends to the defense domain as well. Security ties include not just interactions between the two countries directly, such as visits and exchanges, but also multilateral ones, including within the framework of the Association of Southeast Asian Nations (ASEAN), where Thailand is holding the annually rotating chair during 2019 (See: “Thailand’s ASEAN Chair Challenge in 2019”). The development of the defense relationship has continued on during the past year as well, including through regular interactions such as exchanges and visits. That includes trips made by Brunei military officials to Thailand following a series of changes in the sultanate tied to wider domestic politics there. Last week, the defense aspect of the relationship was in the headlines again with the introductory visit of Brunei’s land forces commander to Thailand. 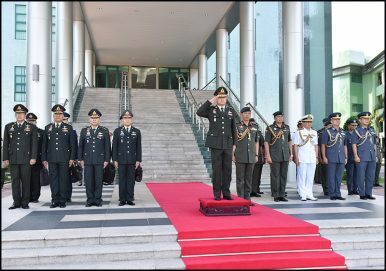 The commander of the Royal Brunei Land Force (RBLF), Dato Seri Pahlawan Awang Khairul Hamed bin Awang Haji Lampoh, made an introductory visit to Thailand from March 12 to March 15. The RBLF commander’s visit included a series of interactions. He met with Thai officials including Apirat Kongsompong, the commander-in-chief of the Royal Thai Army, and Bundit Boonyapan, the deputy chief of defense force. Per Brunei’s defense ministry (MINDEF), during these interactions, both sides addressed a range of issues including the importance of enhancing army-to-army interactions, the evolution of ties between the armed forces, and other issues of mutual interest. Apart from this, the RBLF commander also made stops to various defense facilities and other key sites in the country as part of the visit as well. This included the Special Warfare Command Headquarters, where he had the opportunity to view the Special Warfare Command assets in a static display, and the King Rama V Memorial, where he paid his respects. Unsurprisingly, few additional details were publicly disclosed about the specifics of the visit and what both sides had addressed with respect to the defense relationship in terms of particularities. Nonetheless, as we head into the rest of 2019 and beyond, this aspect of the ties between the two Southeast Asian states will continue to be interesting to watch amid wider developments. A look at the significance of a recent bilateral interaction between the two Southeast Asian states.